Welcome to India, You will be received by Premium India Tours representative at international airport and assisted to your hotel. In the Hotel you will have a brief description of your tour and the representative will hand over your documents regarding the tour, Overnight at Hotel. After breakfast take sightseeing tour of historic city visiting Old Delhi visiting the majestic Red Fort, a marvel in red sandstone, Jama Masjid, the largest mosque in India, both built by emperor Shah Jahan of Taj Mahal fame, Rajghat - memorial of Mahatma Gandhi & a Rickshaw ride past through the silver street in Chandani Chowk, the city tour continues covering New Delhi, visiting Rashtrapati Bhawan, one-time imperial residence of the British viceroys; the India Gate, a memorial raised in honour of the Indian soldiers martyred during the Afghan war; the Laxmi Narayan Temple, built by the Birlas, one of India’s leading industrial families; Humayun’s Tomb, lotus shaped Bhai’s Temple , Qutub Minar , built by Qutub-ud-din Aibek of the Slave Dynasty, In time transfer to Airport for your flight to Jodhpur. On arrival at Jodhpur, meeting and transfer to hotel for overnight stay. After breakfast take a sight seeing tour of Jodhpur including Clock Tower, Mehrangarh Fort situated at an altitude of about 125 meters and is spread over an area of 5 sq. km and it has seven gates, Jaswant Thada is a white marble memorial built in memory of Maharaja Jaswant Singh, later drive to Rankpur and visit world famous Jain Temple and surrounding area. Rest of the time at leisure. Overnight at Hotel. After having an early breakfast, start Horse Safari to reach village Kotri, stopping enroute at the Marwari stud farm at Barkana. After lunch resume the Horse ride to Kotri. Overnight at Hotel. After breakfast ride towards Rohet. Spend the evening watching cultural musical show. Overnight at Hotel. After breakfast drive to Kharwa, which is famous for tomato cultivation. It also boasts of a big artificial lake and an enchanting fort. Overnight at Hotel. 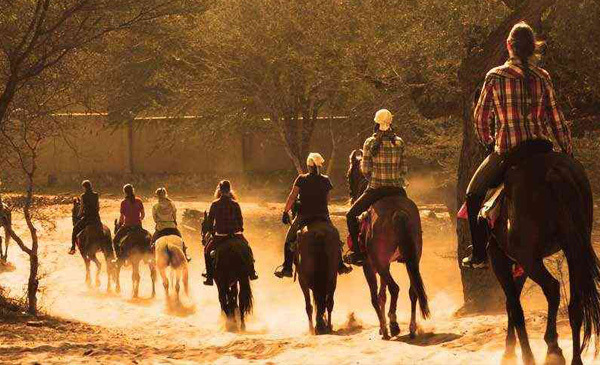 After having an early breakfast start your horse ride towards Pushkar, at the conclusion point of horse safari trip and it is time to say good by to your horses after lunch. drive to Pushkar A city of Pilgrimage from time immemorial with over 500 temples and ghats Pushkar begets a legacy of timeless architectural heritage. Pushkar radiates an ambience of peace and spirituality that casts a lure to visit again and again. After relaxation take sightseeing tour of the city visiting temple of Lord Brahma surrounded by Pushkar Lake. On the banks of the lake, you will see devotees taking dip into the holy waters of Pushkar & offering prayers. Also visit the Pushkar Fair site, which is right opposite the Pushkar Lake. Later explore the colourful market of Pushkar, Overnight at hotel. Break fast at leisure. Start drive to Jaipur. On arrival check-in at Hotel. Rest of the day at leisure, in the evening hours enjoy walking in the colorful streets and bazaars of Jaipur City. The beauty of Jaipur is that its unique architecture and town planning is visible at even the most common places such as its squares and lanes. Overnight at Hotel. After breakfast explore the Pink City with an excursion to Amber Fort, situated just outside the city, enjoy the experience of ride on elephant back to and from the top of the hill on which the fort is situated. Afternoon sightseeing tour of City Palace in the heart of Jaipur is known for its blend of Rajasthani and Mughal architecture. Not far away is the Central Museum. Jantar Mantar is the largest of the five observatories built by Sawai Jai Singh. The Hawa Mahal or the Palace of Winds was constructed for the royal ladies to watch the royal processions without being seen, all monuments are located in the vicinity of City Palace Complex of Jaipur. Later late afternoon is kept free to visit the famous Markets of Textiles, Gems, Carpets, and handicrafts. Jaipur is an ideal place for buying souvenirs. In the evening visit to Birla Temple, speculator white marble temple, glitters in the in the night, at the time of dinner visit to Chokhi Dhani - an ethnic 5 star resort serving Rajasthani & Continental cuisine with live music, astrology, games, folk dances and music, puppet shows in an ambiance of an ethnic village. Overnight at Hotel. After breakfast drive to Agra. En route visit the Old Deserted Town of Mughal Dynasty - Fatehpur Sikri built in red sandstone in honour of Saint Salim Chisti who foretold the birth of 3 sons to Emperor Akbar, is an example of robust stability combined with originality. Each important edifice here represents a type by itself. Notable among them is the Diwane-e-Khas; Punch Mahal, the Tomb of Salim Chisti, and the Bulund Darwaza. After visit, continue to proceed to Agra. On arrival transfer to the hotel. After some rest and relaxation visit to the Agra Fort from where one can get the most moving view of the Taj from the little octagonal tower in the Agra Fort, which lies, across the river Jamuna. In the evening you may visit to the souvenirs market of Agra, one should visit Oswal Emporium where they have built a Mini Taj Mahal inside their showroom and it took 10 years for the artists to complete the mini replica of the Taj. The show room conducts free sound & light show showing the eras of Taj Mahal. Overnight at Hotel. Early morning visit to witness incomparable Taj Mahal with its’ speculative view at the time of Sunrise. Taj Mahal, the architectural modern day wonder of the world; this monument is a fine example of the fusion of many architectural styles is one of the wonders of the modern world. Taj, endowed it with some of the loveliest buildings in the world. Later visit the Pearl Mosque and the Tomb of Itamad-ud-Daula built by Empress Noorjehan in memory of her father. Later drive to Delhi en route visit Sikandra, mausoleum of Emperor Akbar built in 1492; The Tomb is combination of Muslims and Hindu Architectural styles. Continue to proceed to Delhi, Rest of the time free for your own activities in Delhi. In time transfer to International Airport for your flight back to home.